peared during the Middle and Late Triassic (some 220 mya) along with the early dinosaurs. Modern turtles have no teeth, but the Triassic chelonians Proganochelys and Triassochelys (Fig. 18) still had a few teeth on their palates. So, too, had the Australochelidae from the Late Triassic of South America and the Early Jurassic of Africa, which still retained some palate teeth as in Australochelys. Teeth had disappeared almost completely by the time the Jurassic forms evolved. On account of their rigid shells, respiration presents special problems for Testudines, because it is not possible to pump air in and out of the lungs by movements of the chest. Furthermore, the lungs are emptied when those species that are able to do so withdraw their heads and limbs into the shell. A turtle or tortoise that has been attacked or disturbed may have to remain in this state for a long period. It is able to do so, however, thanks to the evolution of a number of physiological mechanisms which must already have been present in its Meso-zoic forebears. These include the ability to tolerate high levels of carbon dioxide in the blood. In other vertebrates these increase the acidity (or decrease the pH), but in chelonians this effect is counteracted by means of a buffering system of bicarbonate ions, serum proteins, and haemoglobin in the blood. In addition, turtles are capable of filling and emptying their lungs more completely than most other vertebrates can. In consequence, when the head and limbs are withdrawn, the lungs initially contain very little carbon dioxide. The muscles of turtles are often surprisingly red, due to their high myo-globin content. These animals are therefore able to store significant amounts of oxygen, not only in the haemoglobin of the blood but also in the myoglobin of the muscles. In addition,they can incur an 'oxygen debt',which is later paid off by panting or breathing rapidly. In setting up an oxygen debt, energy is supplied to the muscles by the anaerobic conversion of ionised pyruvic acid, with the production of lactic acid,which is stored in the muscles and later conveyed to the liver to be oxidised. Although it is somewhat toxic, turtles can tolerate much higher levels of lactic acid than most other animals. A modern land tortoise can voluntarily holds its breath for periods of 15 or 20 min and may, in this way, economise in water (Cloudsley-Thompson 1999). The ability to spend long periods without respiring is useful, not only to terrestrial chelonians that retract their extremities when disturbed, but also to aquatic species, enabling them to remain submerged for long periods. These periods are extended by bradycardia (slowing of the heart rate), which occurs automatically when aquatic turtles dive. Furthermore, these reptiles are able to extract dissolved oxygen from the surrounding water through their buccal linings or thin papillose skin (Pritchard 1979). Movement of air in and out of the lungs is achieved in a number of ways. The pressure in the lungs is continuously being changed by the heartbeat and the movements of the limb girdles, limbs and neck. A membrane behind the lungs can also compress these organs causing exhalation. In marine turtles whose limbs are not retractable, some expansion of the lungs is possible because there is skeletal flexibility of the bridge between the carapace and plastron. Chelonians have changed very little since they first evolved, yet they have survived all the natural catastrophes that eliminated so many other reptilian taxa during the Mesozoic. 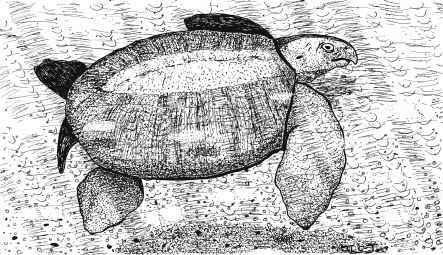 No doubt their life styles also have not altered much during the Era; but Proganochelys and Triassochelys (Proganochelyidae; Fig. 18) may not have developed the ability to retract the head, legs and tail within the shell as completely as the more advanced modern chelonians do. Both these genera were found in the Upper Triassic Keuper sediments of Europe. They were probably semi-aquatic, like modern terrapins: marine turtles did not appear until the Jurassic period. Could that ecological niche have been already occupied by the placodonts (Sect. 4.4.1)? Undoubtedly,tortoises and turtles on the shore would, in Late Triassic times, have seen nothosaurs, placodonts, plesiosaurs and ichthyosaurs in the waters beyond the beaches (Colbert 1965). From the Jurassic to the present day, Testudines have comprised two major groups, the Pleurodira and Cryptodira. The former withdraw their heads by bending their necks sideways, while the cryptodires bend them vertically. Although living pleurodires, such as the matamata (Chelus fimbriatus) and other snake necks (Chelyidae), are all freshwater animals of southern continents, fossil species have been found in all parts of the world and may include marine as well as freshwater forms. Mesozoic reptiles are renowned for their large size, and the Testudines were no exception. The giant turtle Archelon ischyrios (Cryptodira; Fig. 19) from the Upper Cretaceous of North America measured over 4 m in length and, even though its shell was reduced to a framework of trombone-like ribs, may have weighed about 3 tonnes. These ribs were probably covered by a thick coat of rubbery skin, as is the extant leatherback turtle (Dermochelys coriacea), rather than by the usual horny plates. There were fewer predators in the sea than on land in those days, so the greater manoeuverability afforded by reduction in weight would have offset the defensive advantages of heavy armour on the back. Furthermore, the limbs were powerful with extremely long, webbed digits that formed broad flippers to propel the animal through the water. D. coriacea, the largest living turtle, measures up to 2.1 m from the tip of the beak to the end of the tail (carapace length 1.5 m) and weighs as much as 4.5 kg. No marine turtle, either extinct or extant, has been able to retract its head or limbs into the shell as terrestrial chelonians do. baleen-like plates for filter feeding; but what Henodus actually fed on is still a mystery. 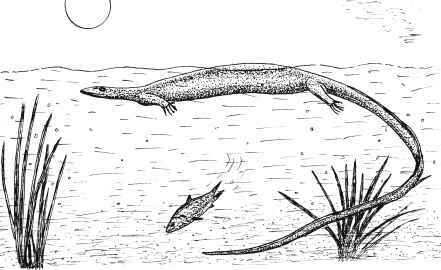 Like the Mesosauria and all other aquatic reptiles, the Placodontia were secondarily aquatic. They were descended from the Protorosauria ('dawn lizards'). 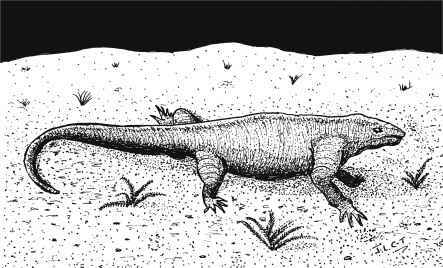 The latter were an odd collection of possibly unrelated Permian and Triassic reptiles, some lizard-like in appearance, others with small limbs, elongated bodies, and extremely long necks. The fossil of Henodus (Fig. 20) was found near Tübingen in southern Germany. It was one of the last of the placo-donts. The skull of the placodonts was short and the nostrils had retreated to a position immediately anterior to the eyes. The front teeth of Placodus (Figs. 21,22) protruded almost horizontally, and were evidently specialised for plucking shellfish from the seafloor. These were then crushed by the blunt grinding teeth, brought together by strong jaw muscles. As can be seen in Fig. 21, Placodus was relatively slim, but the body of Placochelys was broad, and heavily armoured like that of Henodus, with dorsal scales that coalesced to form a heavy carapace over the back. It had a tapering, toothless snout that may have been used like forceps, and fewer grinding teeth than Placodus (Fig. 22; Spinar 1995). they swam slowly along, they would have darted their long, flexible necks from side to side, catching with their numerous sharp teeth any fishes that came within reach. Nothosaurus (Fig. 23) was a typical example. The nothosaurs probably spent part of their time fishing at sea, part resting on land. Their feet had five long toes that were webbed to varying degrees - as in Lariosaurus, Ceresio-saurus, and Pistosaurus (Fig. 24) - and their tails quite possibly bore fins. swimming. Indeed, Lariosaurus probably spent much of its time paddling around in coastal shallows, feeding on small fishes, crustaceans, and molluscs. In contrast, the toes of Ceresiosaurus were relatively much longer than those of most other nothosaurs. In addition, the animal exhibited hyperphalangy - the phenomenon in which the number of phalanges in each toe is increased. The flippers would therefore have been efficient swimming organs, anticipating the great oar-like limbs of the plesiosaurs of the Jurassic period (Palmer 1999). 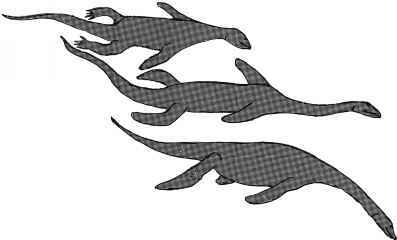 In-deed,the nothosaurs may well have been ancestral to the Plesiosauria (Sect. 5.1). Before we leave the nothosaurs, it may be appropriate to mention Claudio-saurus (Fig. 25), a genus of amphibious reptiles that evolved in the Late Permian and persisted into Early Triassic times and whose affinities are at present uncertain. The claudiosaurians were diapsids and, like the nothosaurs, have been regarded as being ancestral to the plesiosaurs. They have also been proposed as a sister taxon to them. In the absence of information on groups specifically ancestral to the thalattosaurs, plesiosaurs, and ichthyosaurs, their origin remains a mystery (Carroll 1997). Claudiosaurus was a long-necked, lizard-like marine reptile whose lifestyle may well have been similar to that of the marine iguana (Amblyrhynchus cris-tatus) of the Galapagos Islands. It probably fed under water between episodes of basking in the sun, poking its long, flexible neck and small head into fronds of seaweed to find edible plants and animals. Its feet were not webbed, and its legs would have been folded against the body when it swam. Propulsion must have been achieved by undulations of the body and long, narrow tail. Buoyancy would have been enhanced by the large amount of cartilage present in the skeleton. The sternum was not well developed, nor was it ossified as in true terrestrial animals: this indicates that Claudiosaurus was not well adapted for locomotion on land (Palmer 1999). was no bending of the backbone either up or down, the tail extending in side view in a straight line from the pelvic region to the tip (Fig. 26). Clearly, the mosasaurs were highly efficient swimmers, propelling themselves through the water by lateral undulations of the elongated body and flattened tail, and using their limbs for balancing and steering (Colbert 1966). The Mosasauridae were among the most rapacious predators of the Upper Cretaceous seas. Their jaws were very long and beset with rows of strong conical teeth. The centre of the lower jaw was hinged, which made the gape very elastic so that large chunks of food could be swallowed. No fossils of young mosasaurs have been found, which suggests that the females may have left the oceans and ascended rivers to breed. The young could then have spent their early lives in that more sheltered environment before migrating back to the ocean. Like modern varanid lizards and in common with many other reptiles both living and extinct, the mosasaurs probably used their long, whip-like tails to great effect in defence. in the Late Cretaceous period, persisted into the Eocene epoch, and became extinct only about 50 mya. Champsosaurus lived in the rivers and swamps of Europe and North America. It had long, narrow jaws with pointed teeth - like those of the modern gharial (Gavialis gangeticus). Although the Lepidosauria and Archosauria were and are both diapsids, they are not closely related. The similarity between Gavialis and Champsosaurus is due to convergence. Narrow jaws are an adaptation for eating fishes. These are caught with a sideways sweep of the head through the water: it would not be possible to move a broad snout quite so rapidly. Champsosaurus probably swam as crocodilians do, by means of lateral undulations of the body and tail, while their limbs were held tightly against the side of the body where they did not interfere with their owner's streamlined shape. The great width of the skull behind the animal's eyes provided a large area for the attachment of strong law muscles, and Champsosaurus was capable of giving a very powerful bite. It probably ate birds and mammals as well as fishes, as does the Indian gharial. 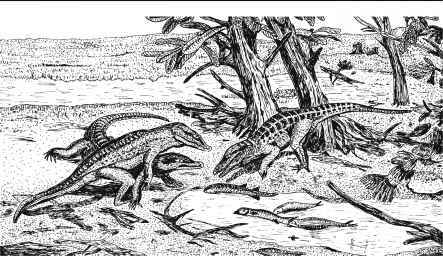 jaws, and rows of sharp conical teeth - showed remarkable parallel evolution with crocodiles. Like those of crocodiles, their hind limbs were longer than the fore limbs; but their nostrils were elevated on a bony lump near their eyes, far back in their skulls. (In crocodiles the nostrils are placed at the tip of the snout.) Furthermore, the phytosaurs had no palate. As in crocodiles, the forms illustrated in Fig. 30 have eyes with slit pupils (Sect. 4.3.4). Phytosaurus (as reconstructed by M.M. Colbert) is shown about to scavenge on the decaying carcass of a dinosaur. All the thecodonts, including the phytosaurs, became extinct at the end of the Triassic period but the ecological niche they had once occupied was eventually exploited by true crocodiles. was originally classified with the ornithosuchians (Sect. 8.4.3),which it resembled in possessing a lightly built body and disproportionately large head. Moreover, it was bipedal and probably chased small lizards, killing them with its powerful jaws armed with sharp, recurved teeth. The structure of its skull, cervical vertebrae, and limb joints prove unmistakeably that it was a crocodilian. 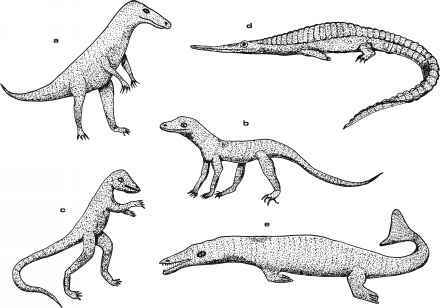 Surprisingly, therefore, the ancestors of true crocodiles must have been small, bipedal animals such as Terrestrisuchus (Fig. 31b), Saltoposuchus (Fig. 31c), and other Saltoposuchidae known from the Upper Triassic rocks of Europe. All these probably fed on small reptiles, insects and other arthropods. 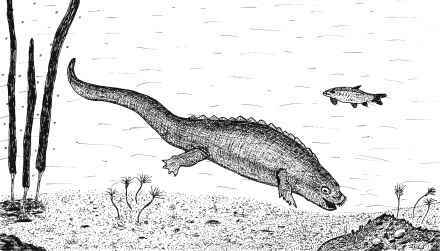 Despite their general appearance and insectivorous mode of life, the Saltoposuchidae, like the Sphenosuchidae, possessed a number of diagnostic crocodilian features. These included the elongation of the main wrist bones into rod-shaped elements and a long backwardly pointing spine on the lower part of the pectoral girdle, while the pelvis had an open acetabulum (hip socket). In addition, there were a number of crocodilian specialisations in the skull (Parrish 1997; Benton 2004). Terrestrisuchus was smaller and more delicately built than Gracilisuchus. Its body was shorter, its limbs long and slim, and its tail almost twice the length of its head and body combined. It roamed over the semi-arid plains of Europe during the Late Triassic, snapping up insects and small lizards with its elongated jaws. No doubt it moved mainly on four limbs but, like its ecological equivalents of today, the frilled lizard (Chlamydosaurus kingii; Agamidae), the basilisk (Basiliscus basiliscus; Iguanidae) and the collared lizard (Crotaphytus collaris; Iguanidae), it would have reached its greatest speed bipedally. It must have sprinted on two legs, not only when in pursuit of prey but - even more importantly - when escaping from predators. rhynchus fed on ammonites, belemnites, large fish, and pterosaurs. Geosaurus was about the same size as Metriorhynchus, but even more streamlined. One fossil specimen from southern Germany was outlined by a fine film of carbon which indicates the shape of the fleshy limbs when the animal was alive. It swam by powerful undulations of the body (Massare 1988). It is probable that the metriorhynchids would have had difficulty in walking on land. They may well have hunted cephalopods and fishes by sudden acceleration through the water (Benton 2004). 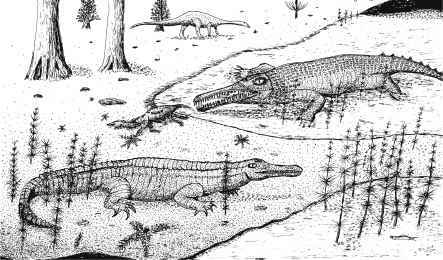 The Eusuchia ('true crocodilians') appeared in the late Cretaceous, were distinguished by the possession of a secondary palate and were very like modern forms. Only the skull and some skeletal fragments of the most spectacular of these, Deinosuchus (Upper Cretaceous), have been found. The skull measured 2 m in length, which suggests an animal 15 m or more in total length if its proportions were the same as those of other crocodiles. It inhabited the swamps of North America where it probably ambushed dinosaurs, especially plant-eating duck-billed hadrosaurs. It had a secondary palate that would have allowed it to open its mouth while submerged without swallowing any water - an advanced feature also found in extant forms. D. hatcheri from the Upper Cretaceous of North America probably weighed about 15 tonnes and is the largest of all known crocodiles. No doubt the four types of locomotion found in extant crocodiles were present in these ancestral forms. There are as follows: (1) sprawling, with the limb joints sticking out sideways; (2) the high walk, which is the normal gait, with the limbs tucked under the body; (3) the belly run, in which the animal reverts to the sprawling posture and slides over the surface of the ground, pushed only by the hind limbs as it escapes rapidly into water; and (4) the gallop, which has only rarely been observed. When small animals are surprised in sleep, they sometimes bound or gallop to the water especially when it is some distance away (Cott 1961). Like plesiosaurs and extant crocodilians, the Mesozoic Cro-codylia probably swallowed stones as ballast (Sect. 5.2.1). The eyes of modern crocodiles and alligators have vertical slit pupils, and the same was probably true of the phytosaurs and early crocodilians. An iris with a vertical pupil aperture is characteristic of primarily nocturnal animals that are also active during the day. When fully closed, a slit pupil is capable of excluding a higher proportion of light than a circular pupil while, when fully open, permitting more light to enter the eye and register on the retina than is possible with a round pupil. A reflective tapetum is also present at the back of the retina. This increases the amount of light that stimulates the visual cells by reflecting the light back again through the retina. For this reason, the eyes of crocodilians appears to glow when illuminated at night when the pupil is dilated. When hunting under water, the eyes of crocodiles are protected by the transparent nictating membranes, but vision may be difficult in dark, muddy water. Crocodiles also have acute senses of smell and hearing. The olfactory areas of the brain are well developed, the inner ears highly developed and the auditory canal extends across the head. This presumably assists in the detection of prey, while sensitivity to a wide range of sound frequencies ensures that the young can be heard calling from within their eggshells at the time of hatching (see Ross 1989). Where Mesozoic reptiles are represented in the world today by living relatives, as in the case of the turtles and crocodilians, it is often easier to imagine their modes of life than those of taxa with no living representatives. Nevertheless, it is possible to form a shrewd idea of the ways in which extinct animals would have behaved by comparing them with unrelated forms that were probably their ecological equivalents in another era. For instance, most aquatic predatory tetrapods have long, prehensile jaws, armed with pointed teeth that grab the prey and kill it. Few of them have dentitions adapted for cutting the bodies of their prey, as these cannot be used on objects that are floating freely in water. Instead, caniniform or dog-like teeth are employed to hold and kill the prey. In some cases crushing dentition is used to deal with hard-shelled molluscs and crustaceans. Small prey is dismembered by shaking it from side to side: pieces that are thus torn off are swallowed whole. Larger prey cannot be dismembered in this way. Instead, the predator twists pieces off. For example, croco-dilians and their ecological equivalents roll over and over in the water until portions of meat have been torn from the carcass of their prey. is unique in having a reduced mammal-like dentition of simple incisiform teeth, a canine in the upper jaw, and three complex molariform cheek teeth. In addition, the snout was extremely short compared with that of other crocodili-ans (Fig. 33). Another very unusual feature was that the articular surfaces of the jaw were elongated, and would have permitted fore-and-aft movement. Internal food processing might well have been related to the possession of a secondary palate which could have allowed breathing to take place during mastication, as in living mammals (Clark et al. 1989). Although these authors realised that the animal must have had a rather specialised diet, they nevertheless considered it to have been an insectivorous predator, perhaps on account of the presence of the incisors and canine teeth. 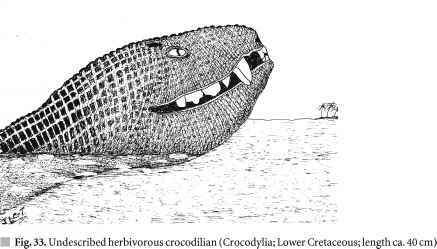 Gillian King (1996), however, suggested that this crocodilian might well have been herbivorous (like many other Mesozoic reptiles). To me, it looks omnivorous. The skull measured about 8 cm in length so the total length of the animal would probably have been at least 40 cm since its snout was so short. Pincer-like jaws with caniniform dentition have evolved in many different semi-aquatic and aquatic groups including phytosaurs, crocodilians, plesio-saurs, and ichthyosaurs - as well as in fossil birds, modern whales, and so on. Crushing and grinding teeth are characteristic of placodonts, mosasaurs, and walruses. Finally, filter-feeding is found in numerous taxa. This is not surprising because it eliminates at least one trophic level between the predator and the primary producers, and exploits these resources directly and efficiently. 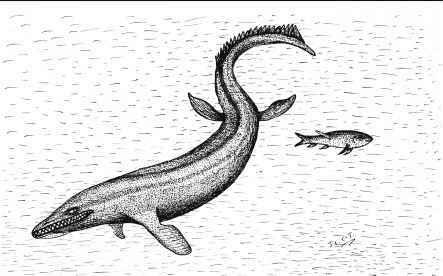 It occurred in some chelonians, some plesiosaurs, some pterosaurs, and possibly in mesosaurs (Sect. 4.1) according to Taylor (1987b). Collin and Janis (1997), however, did not consider any of the marine reptiles to have been filter-feeders. Extant crocodilians have traditionally been regarded as relatively sluggish animals that spend most of the time lying in wait for prey; but they can, in fact, be extremely active when the situation requires it. They have complex hierarchical systems similar to those found in many species of birds and mammals; male crocodilians participate in ritual territorial displays, and elaborate courtship precedes mating. Both sexes assist the young when necessary in breaking their eggshells, pick up the hatchlings in their mouths and carry them to the water where they are bathed before being allowed to swim ashore, and look after them for a couple of months. 'If crocodiles with their typically reptilian brains, are capable of such complex behavioural patterns, there is no reason to suppose that dinosaurs with similarly developed brains should not have led similarly complex lives' (McGowan 1991). Forms with relatively small brains, such as the sauropods, stegosaurs, and ceratopsians had unhurried and uncomplicated lifestyles. The unusual trend in the direction of crocodilian evolution appears to have been from land to sea, and thence to fresh water. This must inevitably have involved osmotic problems and it is not known how these were solved except in the Eusuchia. A salt-excreting gland, which was not restricted to the Croco-dylidae, was probably already present at an early stage of archosaurian evolution and contributed to dispersal across marine barriers of several taxa whose origin was not marine. Heat loss is an important factor to marine reptiles, and living Crocodylidae inhabit only warm waters. The same was probably true of their Jurassic and Cretaceous predecessors because there is no evidence that they ever evolved endothermy. This helps to explain the distribution of their fossils (Hua and Buffetaut 1997). The evolution and distribution of the Mesozoic crocodilians have been reviewed, among others, by Neill (1971), Buffetaut (1989), and Alderton (1991). 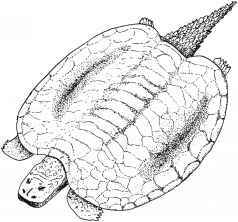 What is the diet of a Triassochelys?